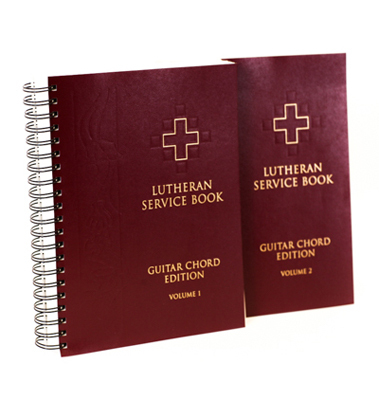 Formatted in an enlarged size with spiral binding, this two-volume accompaniment edition provides the melody line and text of each hymn with chords included above the staff for all 656 hymns in Lutheran Service Book. (Chords for the liturgies are not included.) Designed for both guitarists and keyboardists who play from lead sheets, this edition will be ideal for use in a variety of settings, including the classroom and retreats. The price includes both volumes of the edition. While the melodies and key structures in this edition are identical to the LSB Pew Edition, only in rare instances will the chords assigned here coincide with the harmonizations found in the Pew Edition or the LSB Accompaniment for the Hymns edition. Works for Banjo, too! The chords are complete, just like the keyboard edition. If you know your chords, you can insert passing tones, etc, for a real professional sound. This has been a godsend (pun intended) for me when hymns are used in our contemporary services. I wish it would be offered in downloadable form. I have the Lutheran Service Book on my tablet. It would be nice to have this too. Maybe even in PDF format.